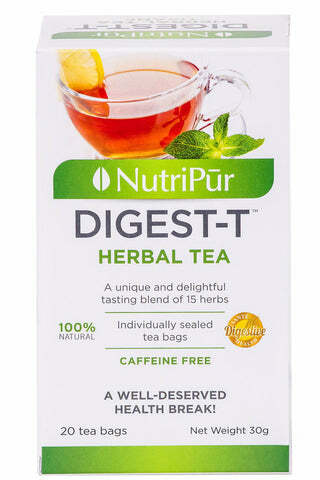 Great tasting digestive herbal tea that also help facilitate digestion! This delicious blend will win you over with its rich aroma and calming benefits. Digest-T herbal tea is a unique and savoury blend of 15 herbs expressly chosen for their therapeutic benefits. It is composed exclusively of herbs with no addition of colour, artificial flavour, artificial sweeteners or preservatives. 100% Natural. Non-chlorine bleached herbal tea bags. Caffeine free. Licorice : Relieves the irritated mucous membranes of the gastrointestinal tract. Boldo : Improves the digestion of fat by stimulating bile secretion. Dandelion : Relieves sluggish digestion after meals.